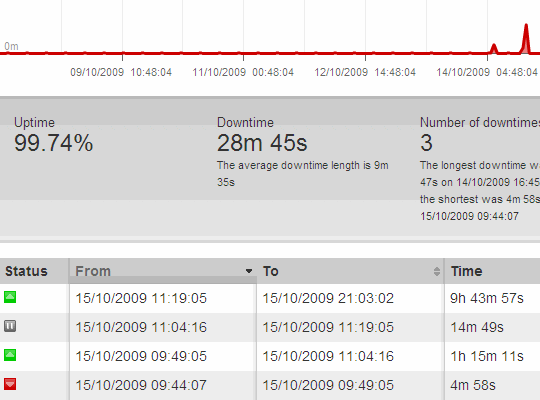 It takes some time to evaluate uptime monitor service properly. So far I had tried few online ones (Uptime Party, Sucuri) and even wrote my own app in AutoIt for such. Anyway I was chatting with Samer of Freeware Genius about hosting reliability and it reminded me that I had Pingdom bookmarked to check out since they had added free account and Daniel Scocco had post on that at DailyBlogTips. Service checks specified server in specified intervals, keeps statistics and sends notifications your way. Checks are made with network of geographically spread probes and they back up each other in a way that network connectivity or lag in specific area is not mistaken for server failure. In one word set of Pingdom functions and settings would be comprehensive. you can get your stats by creating public page or using provided API (apps for Windows and iPhone available). I got email from support, asking if everything works well for me – that’s a first from a free service as far as I remember. Pingdom started as fully commercial service. For a freebie you get all functions but limited to single check and initial pool of 20 SMS alerts will not renew. Perfect offer for most people and those who are serious about web development would probably find service worth its price. You also need to login at least once every 90 days to keep account alive. One of those service that can shatter confidence in best things are free. Actually simple account is free! I am careful about making long-term predictions but in a week of usage I am absolutely happy with this one. Highly recommended to check out. Nice article Rarst. I agree that web hosting is normally quite unreliable. I had an instance of my website going down at a time when some advertiser wanted to review the website, and that cost me the advertising deal. I sometimes wish there was a way to have website traffic redirected to some backup website in those instances. It might be hard to keep backup website in sync with the master one, but I feel it would be worth the effort. I also use a similar service to continuously monitor my website. I use “mon.itor.us” for that (that’s the actual website name). It checks my website once every half hour, and sends me alerts whenever it is down. This one is also completely free, and I haven’t seen any limits on free account. Really like it. Well, I’d say cheap hosting is unreliable. :) It is not impossible to get extremely reliable hosting, but it will come with adequately high price tag. I think half an hour is too large interval (even if it is common for free services of such kind). It won’t catch short downtimes, that can easily add up to considerable sum over time. Pingdom shortest available interval is one minute. One minute sounds pretty good. You are right – short downtimes are missed when interval of checking is 30 mins.